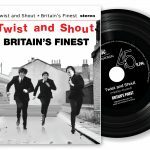 Britain’s Finest gathered at Magnatron Studio to press a 45 single! Vinyl has never gone out of style, but recently music lovers and audiophiles have rediscovered the warmth and wide dynamic range that digital music has yet to duplicate. The band recordered “Twist and Shout” for the A Side, and “There’s a Place” on the B Side. Great music like this deserves a vinyl pressing to do it justice! Head over the Britain’s Finest Shop to buy your copy today!